Pakistan’s largest media broadcaster “Geo TV” has itself became a topic of discussion on the rest of the news channels of Pakistan because of the campaign done by Geo TV after an attempted assassination on Hamid Mir, a leading journalist of Pakistan and anchor person of “Capital Talk”, a talk show on Geo TV. When the news of the assassination attempt appeared on the news channels all Pakistanis prayed for the life and health of Hamid Mir but things started to change just within the first hour. Amir Mir, younger brother of Hamid Mir, told the GEOtv that Hamid Mir had told him before this incident that if he was attacked the Inter-Services Intelligence Director General Lieutenant General Zaheer-ul-Islam and would be responsible, and that that Hamid Mir had received threats from ISI. 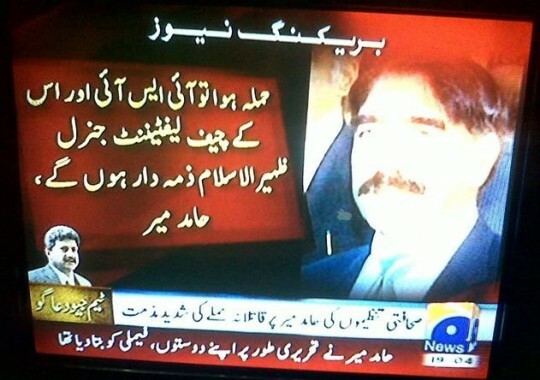 Just after the statement of Amir Mir, GEO started a campaign against ISI and continuously aired the image of Gen Zaheer ul Islam as an accused person in the assassination attempt on Hamid Mir without having any evidence against the chief or ISI. This action of Geo not only infuriated the people of Pakistan but also surprised the journalists and anchorpersons of the other TV channels in Pakistan. This act of GEO TV was strongly condemned on the social media site by the people of Pakistan. #ShutUpGEO trend was started by social media activists in Pakistan to condemn Geo that was later joined by some of the leading journalists, politicians and intellectuals.